Even readers who don't love short stories will find this anthology, starring some of the world’s best-known thriller writers and most-loved characters, appealing and varied. Edited by Jack Reacher’s creator, this book pairs male and female writers and asks them to come up with stories showcasing characters from both of their literary worlds. 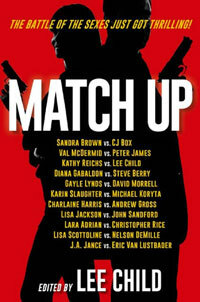 The latest in a series of anthologies that supports the organization International Thriller Writers (FaceOff, 2014, etc. ), this book taps into the talents of some of the best in the genre. Lisa Jackson’s Regan Pescoli teams up with John Sanford’s immortal Virgil Flowers while Kathy Reichs and her Temperance Brennan combine forces with Reacher: this anthology is a treasure trove of likely and unlikely matches that somehow hit all the right notes. Although each reader will have personal preferences, the Karin Slaughter–Michael Koryta entry with a young Jeffrey Tolliver crossing paths with the team of Joe Pritchard and Lincoln Perry in a 1993 case takes home the gold with its witty asides, solid plot, and imaginative approach. As with most anthologies, some stories are more memorable than others, but there’s not a “meh” tale in the bunch. Editor Child pulls back the curtain by prefacing each story with a short introduction explaining how the writers paired off and what their writing process entailed. This glimpse of the creative process reveals not only how the authors approached their tasks, but how some (such as Gayle Lynds and David Morrell) found inventive solutions that allowed them to combine characters who, under most circumstances, couldn’t appear in the same tale. Other pairs add an unexpected touch of time travel (Diana Gabaldon and Steve Berry) as well as some paranormal activity (Lara Adrian and Christopher Rice) to the mix. This box holds a chocolate or two that will be to everyone's liking. Think Dancing with the Stars, but with mysteries. In this 11-entry compilation, each story is by a duo of famous authors and features their most beloved characters. Thus, in one of the creepier stories, Val McDermid’s Tony Hill and Peter James’ Roy Grace find themselves working out the details behind a pair of feet and a footless body in “Faking a Murderer”; in another, Kathy Reichs’ Temperance Brennan is accused of murder, and Lee Child’s Jack Reacher steps in. Most of the stories are police procedurals with some action elements, depending on the author; the odd tales out are a time-traveling historical mystery and a supernatural story, which, in perhaps a “something to please everyone” effort, will make the collection a little less appealing to its core audience of procedural fans. Still, these authors enjoy a huge following in libraries, and patrons will scramble to read the collection, which offers some delicious pairings. No need to stretch for RA ideas here; the authors’ previous works will send this one flying off the shelf.